Many grape growers are going back to the systems of their grandfathers: forgoing chemical fertilizers and pesticides, using horses to plow, etc. How about going back to the system of the Torah? You don't have to be Jewish to enjoy kosher hot dogs, so it stands to reason you don't have to be Jewish to follow "shmita." The Torah mandates that in one of every seven years, agricultural land should be left fallow. Like a lot of Biblical rules, there was a sound scientific reason that people didn't understand at the time. Constantly growing crops depletes the soil, especially in warm regions like the Middle East where year-round crops are possible. Even today, the Israeli government supports the concept of "shmita." In 2015, Israel had a program to pay people to not harvest crops. But it's not the law, and many wineries don't follow it. I had the opportunity in 2016 to visit Karmei Yosef Winery, which makes Bravdo brand wines. Zory Arkin, the CEO and Export Manager, showed me two sections of vines. One had been pruned to be left alone with no crop the previous year; from the other, a normal crop was harvested. I wish I had a good photo to illustrate the difference (sorry). The section that had been pruned down to the base had thick, healthy, young-looking arms shooting up. The other looked like a typical 35-year-old vineyard in winter, with thinner shoots. It was like looking at a before-and-after vineyard from a conversion to biodynamics, which is what shmita reminds me of. Of course, most vineyard owners believe they cannot afford to forego one crop of every seven. Economically they may be right, even if the other six crops have higher quality. And I can't testify to that one way or the other because it's too soon to do a comparison tasting of the wines. I doubt that many vineyards would follow shmita even in Israel without government support. Nonetheless, it is food for thought for vignerons. Have you ever considered taking a year off and giving your vineyard the year off? It might be a mitzvah. 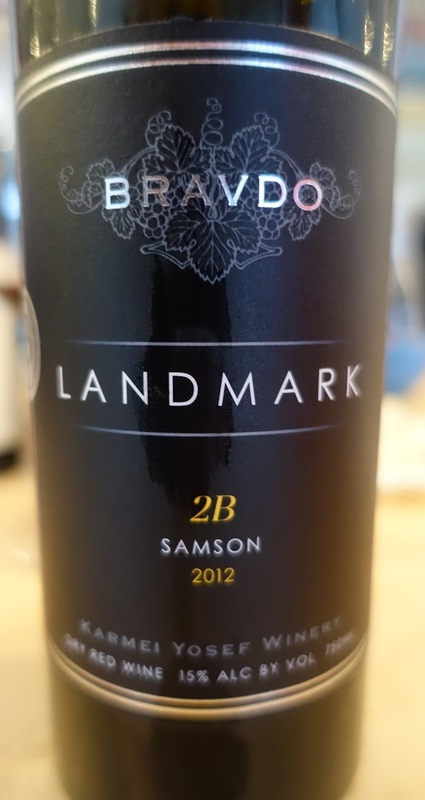 Karmei Yousef Winery Bravdo "Landmark Samson 2B" 2012 ($43) is an interesting wine made with Cabernet Sauvignon and Merlot grapes and Cabernet Franc skins that were added after their juice was extracted for rosé. It's an intense wine with good complexity: lots of berry flavor, and also some baking spices. There's lots of texture, yet without grip. Impressive. 93 points. Buy it here. I visited them in 2014 and the vineyards looked wicked sad. Far too much pesticide use. Maybe they've changed tack? Miquel: This is an interesting point that the authors of the Torah didn't have to contend with. One would think a fallow year would be even more valuable for a place that uses a lot of chemicals. Yesterday I attended a trade tasting of kosher wines. Wish I had read this blog beforehand, as I would have sought out Bravdo brand wines for sampling. Does the entire vineyard have to lie fallow? I would think a more economical approach would be to let individual plots (as part of a "tapestry" of plantings) lie fallow.